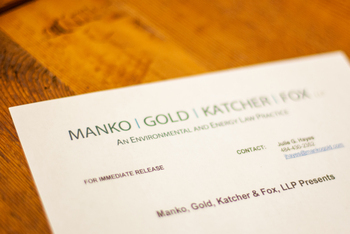 The environmental, energy, land use law and litigation firm of Manko, Gold, Katcher & Fox (MGKF) will be the first host and sponsor of the City Avenue Special Services District’s (CASSD) Lunch & Learn series. This program will focus on sustainability. MGKF partner Brenda H. Gotanda and COO John S. Kirk will team up to present Building the Foundation for Sustainable Practices. MGKF attorney Brett Slensky will offer insight on EPA’s Consideration of New Rule for Retail Hazardous Waste.